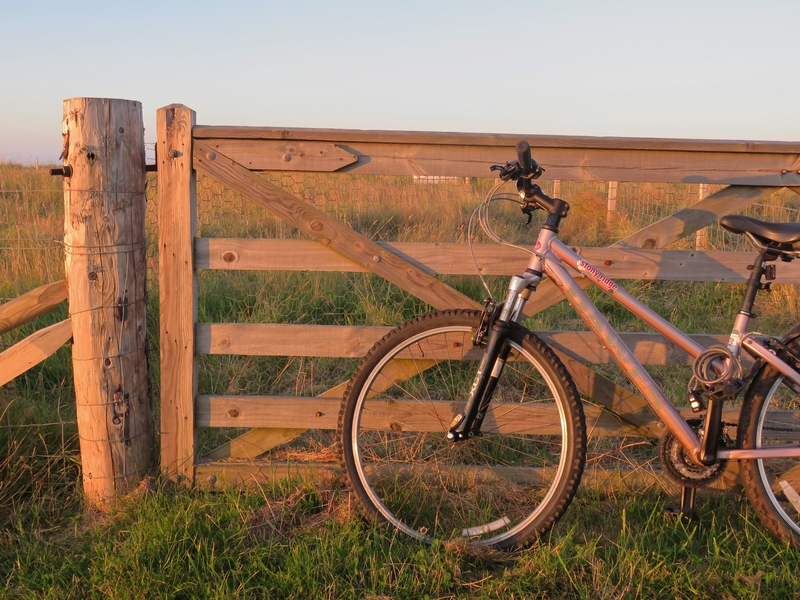 Lindsey Mackay, the Sustainability Intern for the Environment Team, discusses the benefits of cycling to work and on-going projects and developments. The Environment Team strive to improve the sustainability agenda across the University and St Andrews. 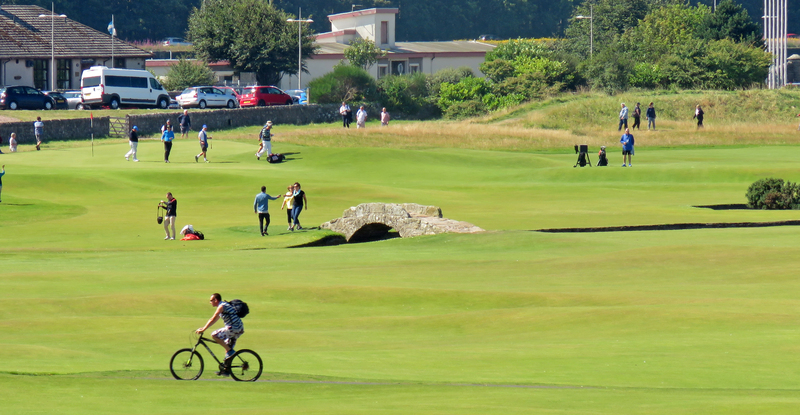 A cyclist enjoys a morning ride through the Old Course. The image that sprung to mind when I first considered biking to work was not a particularly appealing one. Last year the UK saw 1272 mm of rainfall and with this in mind the thought of biking to work didn’t excite me in the slightest. Why would I want to arrive at work cold and wet? Having recently moved to the edge of St Andrews I decided it would be a good idea to bring through my bike so I could easily get from a to b. In St Andrews the image of cycling to work or class is idyllic; cobbled, narrow lanes tucked away within the town center, a backpack full of books, and perhaps a bag full of groceries hanging from the handle bars. Students often choose to bike to their classes only to jump back on at the day to make a mad dash to get back to halls in time for dinner. This image may be familiar to many people, whether you cycle to work or class in and around St Andrews but cycling really does have many benefits! I admit that at the beginning it was a struggle, particularly since I haven’t biked properly for 4 years. However, after a couple of days I started to feel the benefits. I noticed that I arrived at work energised, and found myself to be more productive throughout the whole working day. Now this might not seem like an obvious outcome, and for someone who often needs a mid-morning coffee to help me through to lunch, I certainly was taken by surprise at how refreshed I felt. Cycling provides a brilliant time to think about the day, to reflect and work off any built up stress. Furthermore, you get to beat the morning and evening work traffic which can be rather satisfying, it’s free with no fuel costs to consider, and there are absolutely no concerns about where you will park once you are home. Moreover, cycling is a green and sustainable form of transport, one with 0 carbon emissions and a way in which I can do my part to reduce my carbon footprint. Of course, there are some negatives to cycling, however I wholeheartedly believe that the benefits outweigh any negative aspects. For some using their car is the only way they can get to work but for others biking to work is a very viable option. In 2012 cars represented 13.4% of all the UK’s CO2 emissions for that year. Since then these numbers have been declining, however more action is required. One way in which we can help to reduce the impacts of climate change on our world, the people and ecosystems within is by assessing our individual carbon footprints and taking action to reduce it. It’s true, the actions required may not always be easy however, we have a responsibility to care for our environment. On average you could save £1000 annually by choosing to bike to work. Although these results are conditional on factors including length of journey and type of car, it is evident that the savings are significant making it a more attractive option for people to switch to. Taking an evening bike ride past the Old Course and West Sands. I have now found a way to use an enjoyable mode of exercise to transport me quickly to work, whilst benefiting the environment and reducing my carbon footprint. And biking to work is not the end of the story. 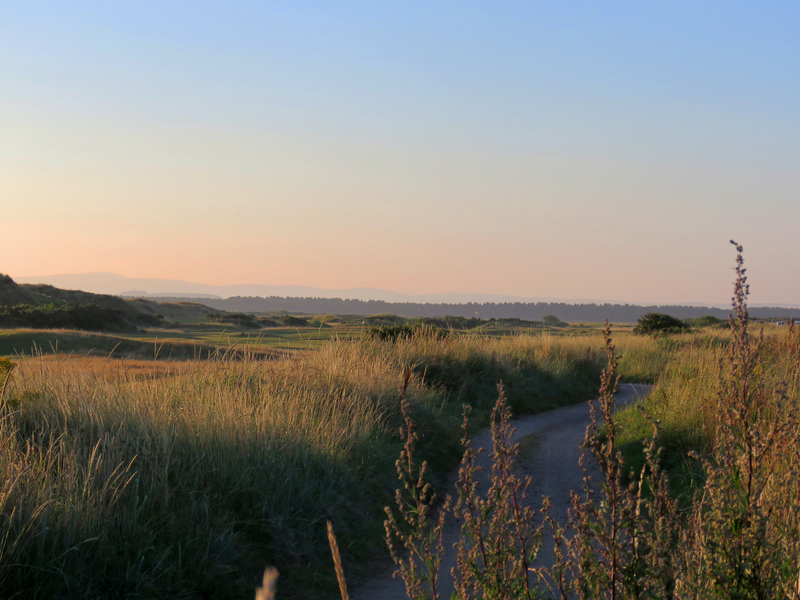 Taking evening rides to chase the setting sun across the Old Course and West Sands has become a favourite past time, and with a beautiful setting like St Andrews I would encourage anyone to go explore in the quiet of the evenings on their bike. It’s true that up till now I have only experienced biking to work in the sunshine and haven’t yet faced the brutalities that can come with a true Scottish winter. I may need to invest in some good quality waterproof trousers. Any recommendations? The University of St Andrews’ Environment team strives to help make the community of students and staff at the university live and act in sustainable ways. Just one of the ways in which we aim to do this is by engaging with staff and students. Recently we conducted a travel survey, now implemented every year, in order to establish the travel patterns and behaviours of those working within the university. The survey included potential effects of the developments at Guardbridge by considering the effects on travel when selected departments move out to the new site. We hope that the results of this survey will help us to put long terms plans into place to encourage and support staff to switch to (or keep using) sustainable modes of transport amidst all the upcoming changes. THIS WEEK in St Andrews there will be a free bike to work breakfast at the Students’ Association on the 25th of August from 8 am – 10 am, and all staff members are warmly welcome. The Bike Pool team will be on hand to give advice and to do maintenance work. Bike Pool do regular drop in sessions around St Andrews and more details can be found by clicking here. If you are interested in cycling in St Andrews please take a look at the new St Andrews cycle map which is now available on the university website. Click on the links for more information or get in contact with us! Evening views across the Old Course. This entry was posted in Uncategorized by Lindsey Mackay. Bookmark the permalink.